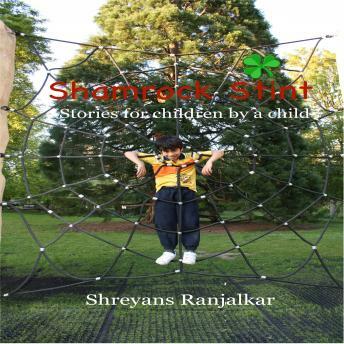 A roller coaster ride of drama, adventure, mystery and fantasy, "Shamrock Stint" is a collection of fanciful fun. Written by child for young Adults, Shreyans Ranjalkar captures his readers and takes them on a delightful adventure through an assortment of stories and genres. "The Dire Night" creeps out from the darkness upon an unsuspecting lad who seems forced, to succumb to the tyranny and enslavement of the devil. "The Curious Case" discovers the dead body of a male murdered at 24th Ace Street and spins a tangled web for Declan O Connor to untangle, as he searches for the murdered. Taking a 360 degree rotation "Shamrock Stint" includes "The Happy Days" which transports readers across the boundaries of time to the happy moments of childhood, family vacations and fun. "Friendship Matters" reconnects friends and awakens school memories allowing you to take a step in the shoes of Rohan and Josh and their attempt to break free from the clutches of "The Three Muscles Band". Navigate through tales of murder, mystery, horror and the warmth of friendship as you're taken to Shamrock for your very own stint of adventure. Let the excitement haunt, taunt, and grip you as you search to unlock the mysteries.